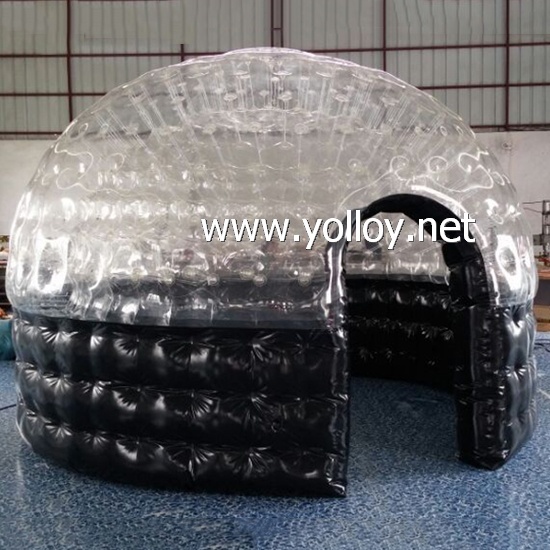 1) As for this bubble tent, it's double layers, air sealed and bottom area with 1m high black color PVC tarpaulin material. 2) Regarding our technology, this dome is made by high heat welding, not stitching. The principle of high heat welding is two materials linked together just as one material. The seams are very air sealed and neat. 3) And material we used are 0.8mm transparent PVC and 0.6mm PVC tarpaulin, which is very durable, UV-resistant and 100% water proof. 4) There are some rings on the bottom of the dome for anchoring. You can use some sandbags or stone and ropes to fix the dome on the ground firmly. 5) With a transparent curtain door, it's a good choice to enjoy spa inside the dome even in winter. Here are some design images below for your reference, please check. We accept customized design and size. Any requirements, please feel free to let us know.